This is an unadopted design for the 1982 British Youth Organization's issue. The design was created on a perforated, gummed quarter sheet, supplied by the British Post Office. The sheet is signed in pen by the designer, Andrew Restall and contains 25 roughs multicoloured hand painted, pen and ink stamp size designs, with Queens head and values. Andrew Restall actually preferred to work in miniature,and was extremely fortunate to obtain official perforated gummed sheets from the Post Office. 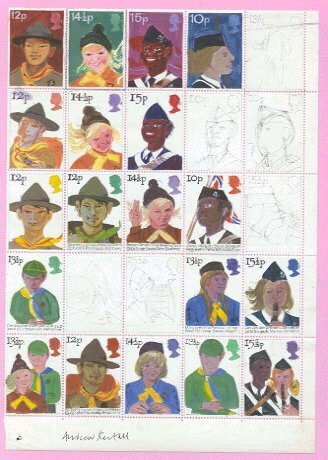 Very few, if any of the other GB stamp designers were privileged enough to receive supplies of such paper.